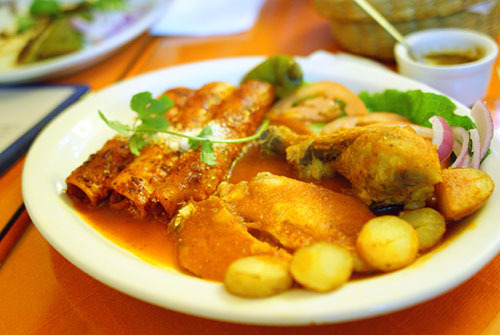 Cenaduría La Casita Mexicana, affectionately known simply as "La Casita," is certainly one of the most beloved Mexican eateries in the Southland. The place first caught my attention earlier this year, when Javier Cabral, a.k.a. (Teenage) Glutster, organized that infamous 18-course tasting dinner here. Located in a somewhat out-of-the-way part of South Los Angeles, La Casita is the brainchild of two mustached men: Jaime Martin del Campo and Ramiro Arvizu. The duo, both from Jalisco, opened the restaurant in 1999, and its authentic, en temporada fare was well received by customers and critics alike. Jaime and Ramiro's aim was to change the City's perception of Mexican food, by introducing Angelinos to traditional, varied, unique Mexican cookery, the "food of their grandmothers," made with seasonal, high quality ingredients. Their passion and devotion to the food of their ancestors have earned the pair numerous awards and accolades, and even a spot on Univision's popular show Despierta America. The impetus for this particularly trip to La Casita came from one of my readers, Andrew, a new transfer student at UCLA, one who happens to have training in classical French cooking. 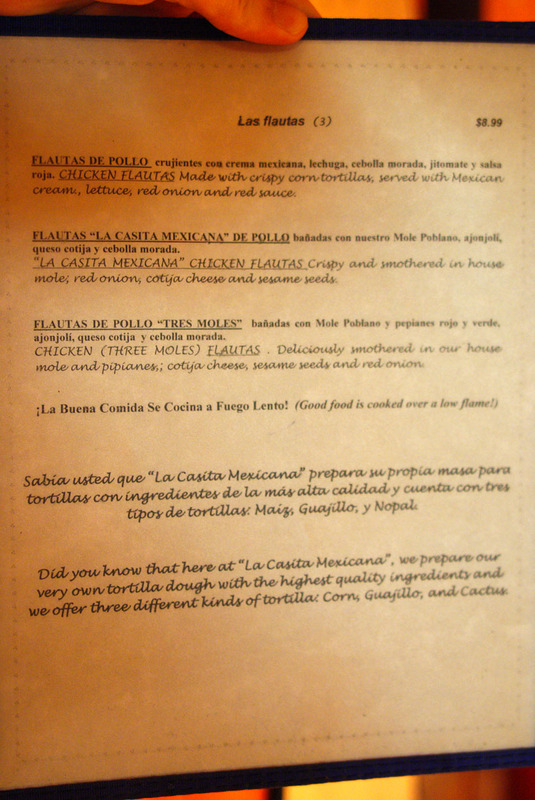 After sharing our "to-eat" lists with each other, we decided upon La Casita as a place that we both wanted to explore. Joining us was Andrew's lovely and talented friend Jenae, a writer for UCLA's school newspaper, the Daily Bruin. 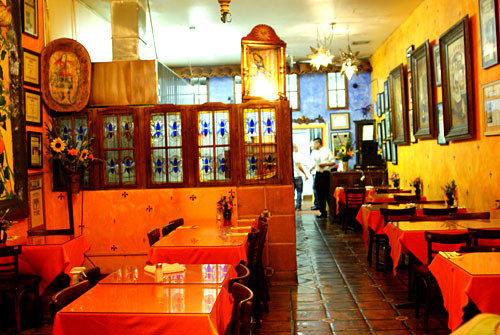 La Casita's colorful exterior leads to an even more cherry inside, replete with stained glass and Spanish tiles, surrounded by artwork-drenched walls in hues of blue and orange. The place has a fun, festive feeling. 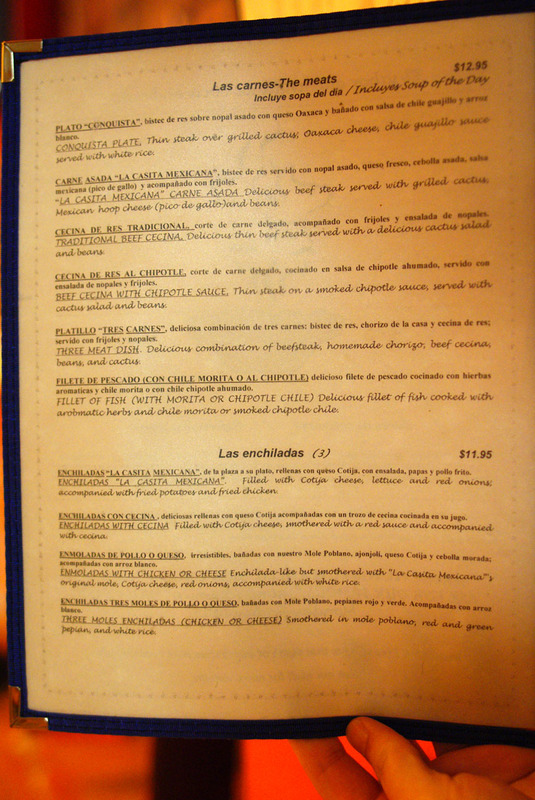 La Casita Mexicana's menu is tight, focused, and divided neatly into sections. 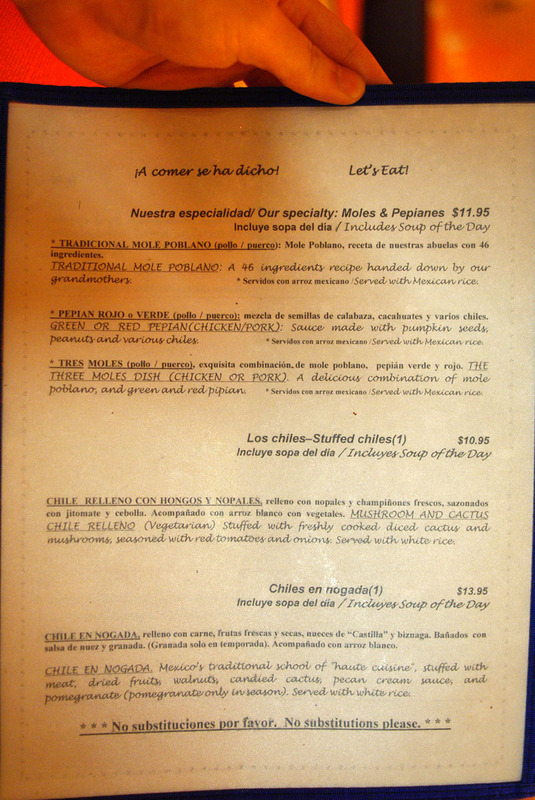 Try to eat your way around the carta (just make sure to order the tres moles), and since portions are fairly large, I think that it's best to go with a group and share. Click for larger versions. 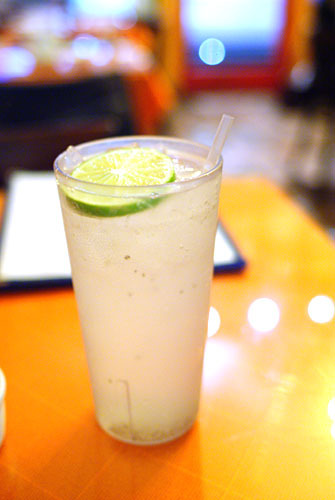 To wet my whistle, I asked for a glass of the Aqua de Limon con Semillas de Chia [$2.25], which came recommended by our server. It was basically a lemonade, but one tarted up with seeds of the chia plant (Salvia hispanica). The seeds were somewhat glutinous, and acted as a mild thickening agent for the delicious, refreshing, semi-sweet drink. 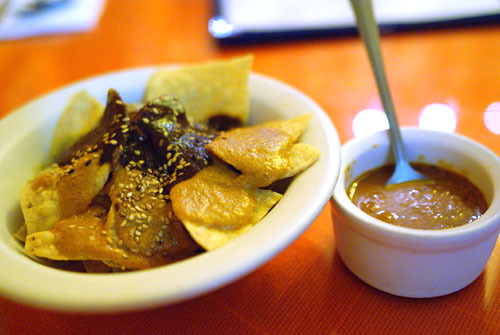 Quick to arrive at the table was a plate of totopos (tortilla chips), topped with three types of mole, with house salsa on the side. The moles made this a nice sweet-smoky alternative to the ubiquitous presentations of "chips & salsa" that you always find at Mexican eateries. Many of the items on the menu come with the complementary Sopa del Dia, or soup of the day. On this particular night, we enjoyed a tortilla soup, made using a chicken/tomato broth base, various chilies, herbs, and shredded cheese. For me, the key was the cheese, which added a richness and depth to the surprisingly delicate soup, resulting in a lovely interplay of contrasting savory and tangy flavors. Quite good. 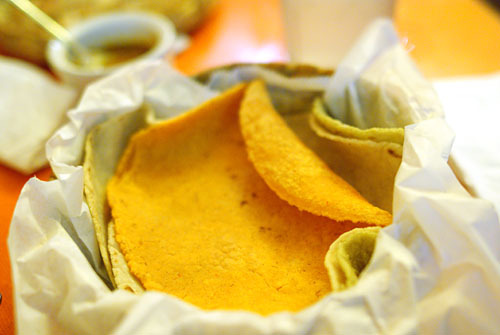 Also with our mains came a small basket of housemade tortillas (which were periodically refreshed). Three types were presented--corn, guajillo chile, cactus--and though I had a difficult time distinguishing them, all were excellent. Here was a trio of enchiladas, filled with cotija cheese, topped with a salsa roja, served alongside fried potatoes and fried chicken, and garnished with lettuce and red onion. Though I'm sure that we've all had enchiladas in some form or another, I don't believe I've had them served with the meat on the side before. The chicken itself was quite tasty, though some pieces were a bit dry, and I especially enjoyed the potatoes. The enchiladas themselves, meanwhile, were nicely imbued with the spicy essence of the chile sauce and heightened by the cotija, though I really wished that the chicken was stuffed inside along with the cheese, to make for a more cohesive eating experience in my mind. 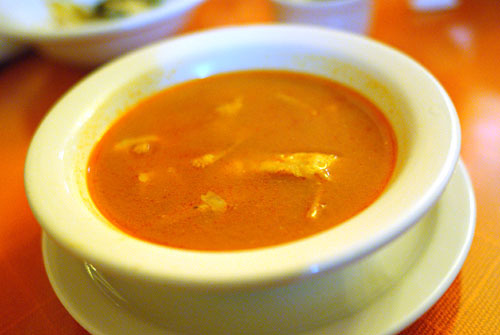 Now here was one of La Casita Mexicana's most well-known dishes, a house specialty in fact. We have four different Mexican cheeses (cotija, panela, Oaxaca, queso fresco), stuffed with poblano chile slices, nopales (cactus), mushrooms, and Mexican herbs (epazote), all wrapped up in plantain leaves and grilled until soft. The result was a rich, heavy, decadent dish, the creaminess and the saltiness of the cheese coming to the fore, accented by the pungent epazote and tempered by the various veggies. I rather liked this one. 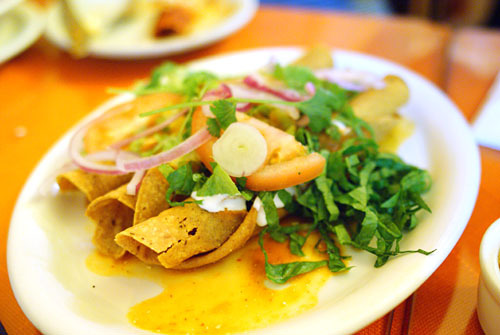 Also known in the US as taquitos, flautas ("flutes") consisted of rolled tortillas, stuffed with meat (chicken in this case), fried, and served with a variety of accoutrements: Mexican cream, lettuce, tomato, red onion, and red sauce here. Though this was perhaps the "safest" dish we ordered, I nevertheless enjoyed it. The chicken itself was surprisingly tender, yet flavorful, and went nicely with the crispy tortilla shell. The various toppings, meanwhile, provided some context and contrast to the meat. Chile relleno is a fairly well-known dish around these parts, but La Casita's version was a bit different than what I'm accustomed to. 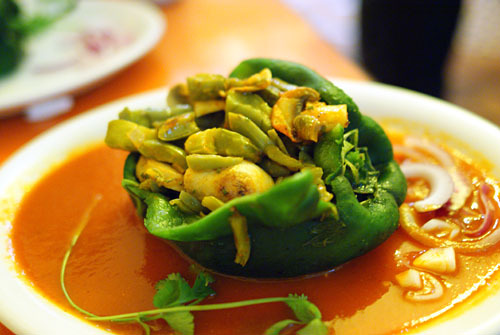 It was a much sparer preparation (no meat, no cheese): a chile stuffed with cooked diced cactus and mushrooms, and seasoned with red tomatoes and onions. This was one of the few times I've had cactus, and the example here had an absolutely fascinating texture, along with very mild, delicate sapor. As such, the mushroom was key in adding a bit of earthiness and weight into the fray, and the tang provided by the tomatoes and onions was crucial in integrating this dish. I would've liked to have seen more done with the stuffing though. If there's one thing that La Casita is known for, it's the mole. 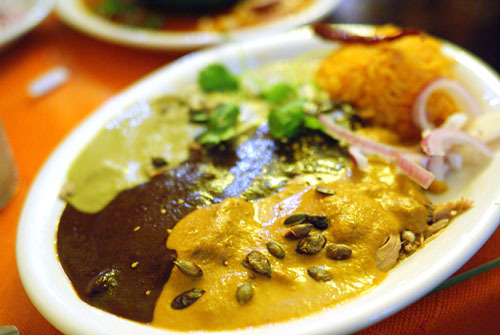 Though there are numerous types of mole abound, the restaurant typically makes three: poblano, rojo, and verde (rojo and verde are also known as pipian for their use of pumpkin seeds). The trio came served atop pork, finished with Mexican rice. Mole poblano is what most of us think of when we think mole. Here, it's made with a whopping 46 ingredients, including dried chile peppers, nuts, spices, and chocolate. The end result is a perfect smoky/sweet flavor that's forceful but not overbearing. Rojo, on the other hand, is a lighter, spicier mole, with distinctly earthy notes, while the verde, made with Serranos, is more focused, brighter, sharper. All three were a joy to eat with the pork, and I even enjoyed the rice, which had a marked "seafood" tang to it. 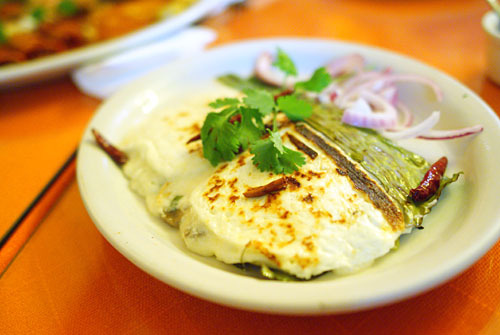 We end with the famous Chile en Nogada, a Pueblan dish from Mexico's traditional school of "haute cuisine." 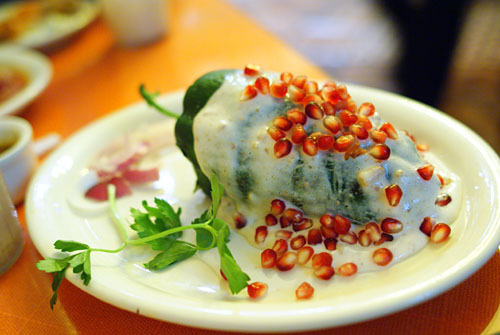 It's basically a poblano, filled with picadillo--meat, dried fruits, walnuts, candied cactus (dulce de biznaga)--and topped with a pecan cream sauce and pomegranate seeds. The pork mixture was perhaps a touch sweet for my tastes, but it was balanced beautifully by the crisp, tangy pepper. At the same time, the pomegranate heightened the picadillo's sugariness, while adding a great textural component. 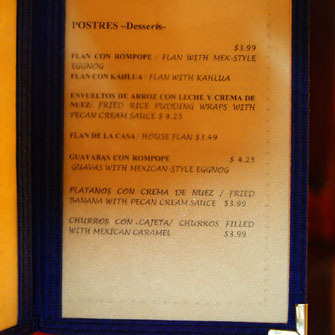 Though we were all quite full at this point, we eagerly read through the dessert menu to choose our postres. Click for a larger version. 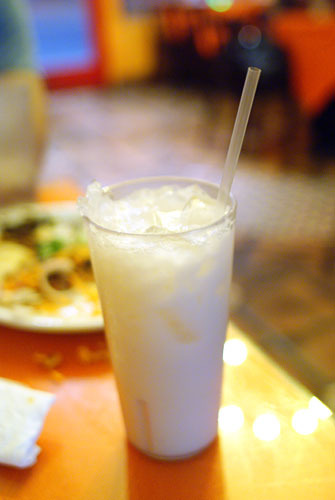 To go with the sweets, I ordered up a tall glass of Agua de Horchata [$2.25], a sweet rice drink that was easily the best horchata I've ever had, with light, bright flavors backed by fantastic notes of rice, spice, and cinnamon. Delish! Much to our surprise, the chefs decided to send out a complementary tasting of three types of flan: regular, sweet potato, and corn. 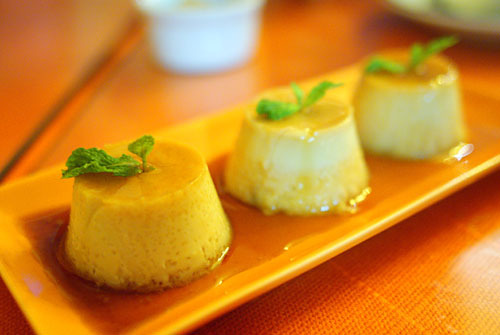 We started with the regular version, which had the signature flan flavor that we craved, along with a somewhat firmer texture than usual. Next was the sweet potato, notable for its grittier texture. The corn, finally, was interesting for its characteristically corn aftertaste. Very nice. 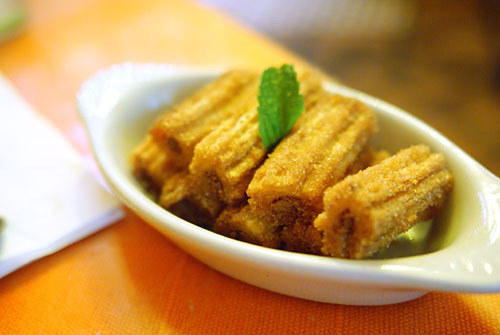 If there are churros on the menu, then I must have them. Here, they came filled with cajeta, a sugary syrup made from caramelized milk. The churros themselves were superb--light and fluffy with a delectable sweet finish--and were perfectly balanced by the weight and power of the cajeta. Though I've certainly ventured past the bastardized fare that passes for Mexican in this country, I'll admit that I'm still somewhat of a neophyte when it comes to traditional Mexican cookery. Nevertheless, to me, the food that the kitchen put forth here screamed honesty, authenticity, quality. It's a world beyond the familiar lure of burritos, yellow cheese, hard-shell tacos, and sour cream, and if all goes well, I think that Jaime and Ramiro are well on their way to changing our preconceived notions of Mexican food, maybe one palate at a time. I did the dineLA option recently and got almost all the same items. The moles and flan were probably my favorites. I think La Casita definitely elevates Mexican food to a new level. 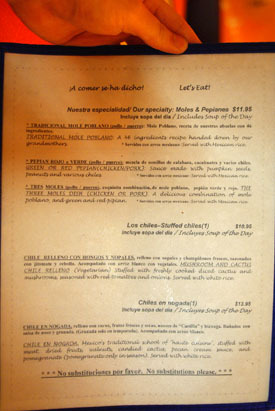 I actually didn't have any of La Casita's regular menu. When Javier brought me, we had a special chef's meal all off-menu. Good to see what they actually serve there regularly. LCM is my favorite mexican restaurant in the city. I'm hitting it up again as soon as I get back to LA. That Chile en Nogada is gorgeous. Hope you submitted to Tastespotting!!! I was wondering what the SoCal equivalent of French Laundry is. That is, what is the best that LA has to offer? The interior looks just like the nicer places I've eaten in Mexico. I've been wanting to go here for quite a while now. Perhaps I'll hit it up when Mattatouille comes back to town. It was really fun having that dinner with you, Kevin. Jenae and I were all abuzz about the whole experience afterwards of meeting you and the two very kind chefs. It's great to see these pictures and read your reflections afterward, and I hope we share another meal soon. kev - love the site, love the reviews, keep em coming.....but i always laugh/cringe whenever i read about wetting your whistle. i swear - that term makes you sound like you're 65! HAHA =) all in jest though! Great post! Your photographs turned out beautifully and, as Andrew wrote, we ended up chatting on the way home about what a lively meal that was. It's fun to read your reflections on the dishes, too. Our conversation about the blogging community inspired me to try and do more of my own blogging, so I'm putting together my L.A. blog (finally!). So, thanks for the inspiration! 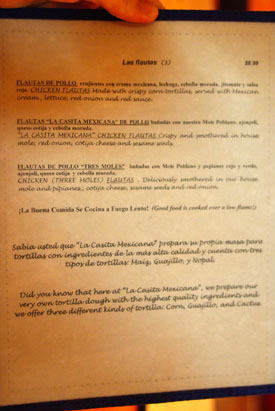 La Casita Mexicana is one of the places I really want to try. I need to bug Javier to have him show me the ropes next time! WC: Is there anything you'd recommend that we didn't have? 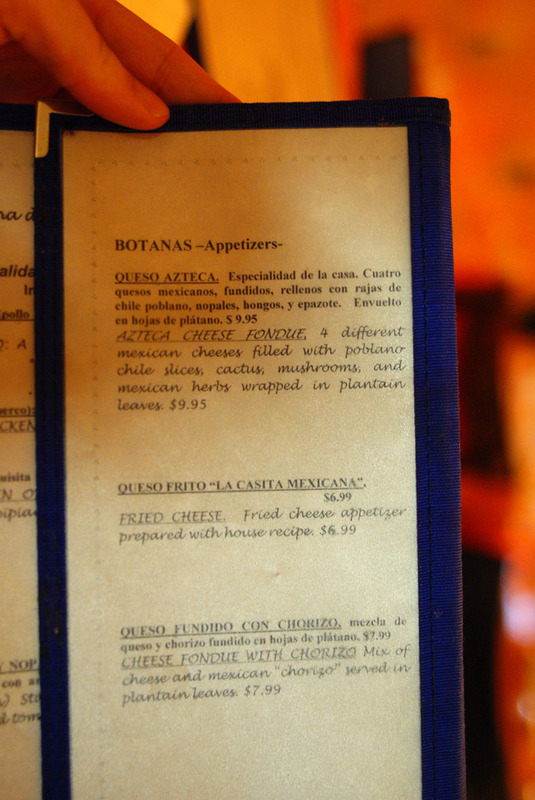 Aaron: I thought that there were a few on-menu items, such as the Queso Azteca. Matt: And when are you coming back? Seems like you've been gone for ages. Jo: I actually submitted the photo last night, and it made the cut! See here. Anna: Unfortunately, there is no real equal to FL down here. I'd say that the closest thing would probably be Providence. Andrew: Great meeting you at dinner! Just let me know if there's anything else you want to do. Jenae: I look forward to your blog! Are you going to start a new one, or use The Happiness Realization? Danny: I'm surprised you haven't been. Maybe you and Cathy could go out together? Or, I say just have Glutster organize something again! The only other dishes I got that you didn't were a ceviche with Mexican herbs (OK, but thought the herbs were more prominent than the fish in flavor. ), grilled fish (OK, nothing special), rice pudding in a deep-fried shell (Very pretty, rice pudding was a bit sour. ), and highly recommend their Mexican coffee (Had a nice spice and comes with excellent brown cane sugar). I really miss LCM's Queso Azteca and enchilada with cotija cheese. Reading this makes me want to make that drive again. Plus I didn't get to try the corn flan last time!